How much more can South Africans take? I WAS going to start this column by asking the same question The Sunday Times’ Hogarth used to ask of Zimbabweans in the early years of Robert Mugabe and Zanu PF’s destruction of the Zimbabwean economy, some ten years or so ago. Hogarth’s question at the time began along these lines: “… but what will it take to make the Zimbos angry?” Over several weeks, I looked forward to reading more about the crazy, unbelievable, brazen things that the much-celebrated African hero Mugabe – no wonder our standards tend to be so low – and his so-called liberation party used to do to ravage the one country that many proudly used to describe as southern Africa’s bread basket. Hogarth wrote about the rise of gangs of teenage boys – child soldiers Zanu PF-style – who, more than two decades after Zimbabwe became independent, got mobilised to spread mayhem throughout the country. Only a few people seemed to have noted at the time that Zimbabwe’s independence preceded the births of many of these child solders. Because this was Zimbabwe, and despite the much touted quality education Mugabe always gets praised for having invested in during the early years following independence, most people strangely forgot to calculate the rascals’ ages. So, the child soldiers Zanu PF-style were conveniently referred to as “former liberation fighters” in order to add gravity to their mayhem. Like an uncontrolled colony of ants, they went from cities to towns, and from towns to villages and farmlands destroying whatever stood in front of them. They killed many innocent men, women and children who were suspected of opposing the madness of Mugabe and Zanu PF, and they made others disappear right up to this day. They confiscated productive farms from white owners and handed them over, in a pecking order that seemed politically determined, to pre-selected political heavyweights and senior government officials. It was also reported that Mugabe’s wife benefited from a dairy farm during this ant sweep. Now, what will it really take to make South Africans gatvol and tell their leaders “this far and no further”? How, in a country like ours, do we stand by and watch our leaders systematically weaken and destroy institutions that were established to protect us from certain hell? What does Cyril Ramaphosa, he who chaired our Constitutional Assembly in the mid-1990s, really think today when people around him seem so determined to undo what he and others gave so much of themselves to craft for the benefit of all South Africans? And what gives one individual, supposedly a mere senior manager of our public broadcaster, the guts to look our courts in the eye and keep brandishing his middle finger at them without anything happening to him? The same man, seemingly remote controlled by political masters who have subsequently stood up in praise of his actions, has dared impose an apartheid-era style news censorship in a country that suffered so much because of such actions in a not-so-distant past. We seem to forget that many white South Africans claimed – probably with reason – not to have known what successive apartheid governments were doing to their fellow African citizens, thanks to practices exactly similar to what the SABC has now embarked on. Let me hasten to remind those of you who pretend not to remember – or who were either too young or yet to be born – that had there been a successful ban on news coverage of the anti-apartheid riots throughout the country during those years, the world would not have known and acted in our support. Only a few would have heard our cries. If we blindly allow the SABC to succeed in taking this bad leaf from the book of apartheid madness, we too will end up claiming, in years to come, not to have known. 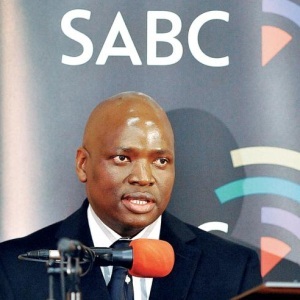 Fortunately for us all, the SABC’s actions will be futile because they come in a different era; an era of social media where citizen journalism – despite its flaws – often trumps traditional reporting. But, given the extents to which we now know this country’s so-called former liberators are prepared to go to get what they want, even the presence of social media might be too early to celebrate. There is no longer a guarantee that a ban on Facebook, Twitter and other “potentially nonsensical” social media platforms will never be considered. The political madness and arrogance is spreading fast. But until then, we should use these platforms to propagate and share events happening around the country for the world to see; we should never be silenced. One also hopes that the madness happening at the SABC will in time be reversed, as the apartheid era censorship would have been imposed by an individual already deemed by our courts to have been unlawfully appointed.